Rushworth is a former gold mining town in northern Victoria, immediately west of the Waranga Basin reservoir. It is 50 km north of Seymour. Rushworth is situated in hilly, agriculturally unattractive country which is mainly taken up by the Rushworth ironbark forest. Before the discovery of gold Rushworth was part of the Wanalta pastoral run (1840) of 25,000 hectares, which included the freshwater Lake Cooper to the west. The pastoral run lay on a route from Bendigo to the Ovens gold diggings in north-east Victoria. In August 1853, some inquisitive gold diggers found gold at Rushworth, reportedly with the assistance of Aborigines. A rush to the new field brought government supervision. The Assistant Commissioner was Richard ‘Orion’ Horne, one time poet and author. He had come to Australia in 1852, and is credited with naming Rushworth. On the voyage out his fellow passengers were the Rushworth family, and the ‘rush’ to the new gold field was ‘worthwhile’. The alluvial gold was readily mined and was unhampered by water in the workings. On the contrary, water shortages were experienced. The Rushworth township site was surveyed in 1854. National and Presbyterian schools were opened in 1858 and 1859, and were replaced by a government school in 1872. (The school building was incorporated in Rushworth High School, and is on the Victorian Heritage Register). 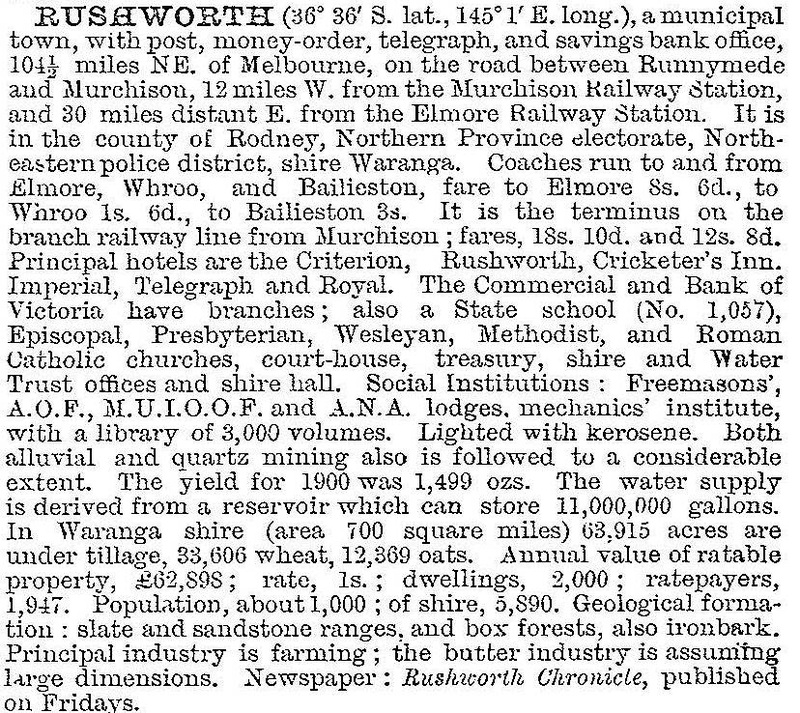 In 1865 Rushworth had the Waranga shire hall, a mechanics’ institute in the hall, a court house, three hotels, and branches of a bank and an insurance company. Although the Rushworth goldfield is a relatively small and isolated one, it has had 26 mines and it operated continuously until the 1900s. In addition to mining Rushworth had timber cutting and brick making. Churches and sporting clubs were opened during the 1870s. Rushworth missed being included on the railway line from Seymour to Shepparton (1880), and it took 10 years of agitation for a branch line from Murchison to Rushworth and another 24 years before the line was extended westwards to the agricultural hinterland at Colbinabbin. As irrigated closer settlement farms were developed from the Waranga Basin storage after 1905, Rushworth became the regional centre for the Waranga shire. To some extent this function offset the decline otherwise occasioned by the end of gold mining, and Rushworth underwent modest growth. Facilities such as a golf links and a swimming pool co-existed beside the older billiards saloon and coffee palace. A second branch railway line to Girgarre was opened in 1917. During World War II the Waranga district held most of Victoria’s internment and prisoner-of-war camps. Two camps were a short distance north of Rushworth. Rushworth has a large stock of old buildings. The court house (1880) and the Chronicle printing office (1910) are heritage listed. A conservation report in 1988 also noted a shop and residence (1864), the Commercial Bank (1884), the former Imperial Hotel (1858), the Criterion Hotel (1890) and the mechanics’ institute (1913 – the latter building constructed when an earlier one was removed for the railway), the shire hall (1868), the court house (1877) and the bandstand (1888). The Anglican church and Sunday School (1870) occupy a dominant hill top. In addition to the historic buildings and streetscape Rushworth has a hospital, a nursing home, two recreation reserves, a golf course, a swimming pool, a caravan park, a Catholic primary school (1953) and a museum in the mechanics’ institute building. The P-12 school, successor of the high school (1961), had 173 pupils in 2014. The State forest, in addition to being riddled with tracks and mine workings, has a wildflower reserve and a lookout tower. The shire hall is a district office for the Campaspe shire which is headquartered at Echuca; most of Waranga shire was absorbed by Campaspe in 1994.